... sensations of latex. Here, the right material thickness is crucial: the dress shirt has to feel compact, but still needs to fall loosely in order to resemble the characteristics of a textile dress shirt. At our SIMON O. manufactory, we took up that challenge and created exclusive, exciting and attractive latex dress shirts in which you’ll make eye-catching and convincing appearances. By the way: a latex dress shirt is 100% non-iron, of course. 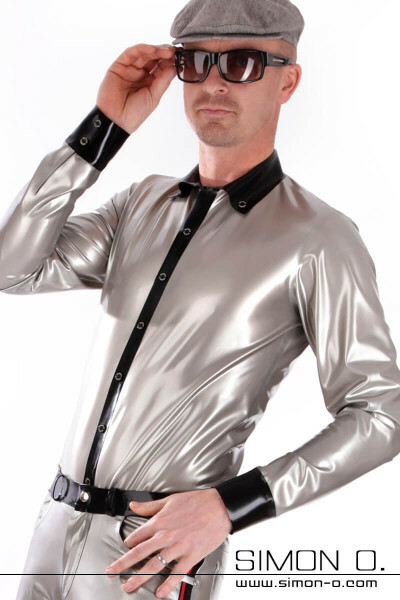 Of course, a latex dress shirt isn’t made for every occasion. However, if you are ready for the exceptional, it’ll ensure a fabulous, stylish appearance. One of our favorite items is the “simple” latex dress shirt. Due to its high-quality fabrication, the dress shirt fits as it’s supposed to do, falls smoothly but still is decent because it’s single-colored. It matches best with casual jeans or even business pants – don’t shy away from combining it with a tie! In case you prefer short sleeves, we offer an item that you can customize with contrasting colors for the neck and the button-down-front, at our shop. A highlight for fashion heroes, romantic natures and cosplayers is the frilled latex dress shirt. For this dress shirt, we attach elaborate frills on the revere and the sleeve in order to create a somewhat baroque look. Of course, our dress shirts are available in transparent and semitransparent shades – for special moments of excitation: you can wear your latex dress shirt as upper garment, but you don’t have to.